With the majority of the world's population shifting to urban centres, urban planning-the practice of land-use and transportation planning to help shape cities structurally, economically, and socially-has become an increasingly vital profession. 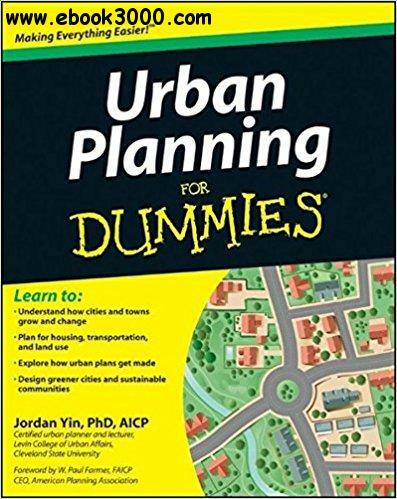 In Urban Planning For Dummies, readers will get a practical overview of this fascinating field, including studying community demographics, determining the best uses for land, planning economic and transportation development, and implementing plans. Following an introductory course on urban planning, this book is key reading for any urban planning student or anyone involved in urban development. With new studies conclusively demonstrating the dramatic impact of urban design on public psychological and physical health, the impact of the urban planner on a community is immense. And with a wide range of positions for urban planners in the public, nonprofit, and private sectors-including law firms, utility companies, and real estate development firms-having a fundamental understanding of urban planning is key to anyone even considering entry into this field. This book provides a useful introduction and lays the groundwork for serious study.